House Minority Leader Bradley H. Jones, Jr. (R-North Reading) is pleased to announce that he has appointed State Representative Mathew Muratore (R-Plymouth) to serve as his designee on a special environmental commission that will study the impact of coastal and ocean acidification on commercially-valuable marine species. Created as part of the 2018 Environmental Bond Bill, the commission will work on developing policies to respond to the adverse effects of coastal and ocean acidification on commercially-important fisheries and the state’s aquaculture industry. 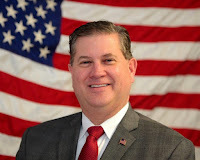 Representative Muratore is one of eight legislators serving on the 19-member commission, which is being chaired by State Representative Smitty Pignatelli (D-Lenox) and State Senator Anne Gobi (D-Spencer), who also serve as co-chairs of the Joint Committee on Environment, Natural Resources and Agriculture. Other state environmental officials serving on the commission include Director of Marine Fisheries Dr. David Pierce; Department of Environmental Protection Commissioner Martin Suuberg; and Director of Coastal Zone Management Bruce Carlisle. Governor Charlie Baker will be appointing the remaining 8 members of the commission. His appointees will include two representatives of an environmental or community group; three scientists who have studied coastal or ocean acidification; and three commercial fishermen, including one who holds a shellfish aquaculture license, one who holds a commercial fisherman lobster permit, and one who holds a commercial fisherman shellfish permit. In addition to reviewing relevant scientific literature and studies related to coastal and ocean acidification, the commission will conduct a series of public hearings and coordinate with the Northeast Coastal Acidification Network and the National Caucus of Environmental Legislators to prevent any duplication of effort. The commission is scheduled to file a report on its findings and recommendations by December 31, 2018. Representative Muratore represents the First Plymouth District. He currently serves as the ranking minority member of the Joint Committee on Tourism, Arts and Cultural Development; the assistant ranking minority member of the Joint Committee on Health CareFinancing; and a member of the Joint Committee on State Administration andRegulatory Oversight.